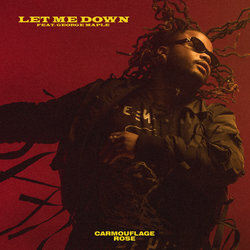 Carmouflage Rose is riding high off the back of two highly acclaimed singles, the ARIA Gold accredited ‘Late Nights’ and recent single ‘Wildflowers’, and is now back with another chilled out hit ‘Let Me Down’ featuring George Maple. Every layer you peel back gives way to another. This 25-year-old Brisbane artist with a unique genre blending sound is making a name for himself as Carmouflage Rose, but his friends just call him Larry—as in happy as Larry. Peel off that layer and you hit another. “My real name is Graham John Herrington. I’ve got the whitest name for a black dude,” he laughs. Herrington was born in Zimbabwe and grew up there before coming to Australia in his late teens as a refugee. Local, displaced, and then home again. Layer after layer. So where is the core of this shapeshifting, emerging artist? For that, you go to the music. With well over three million plays on Spotify, Carmouflage Rose has a sound that’s unlike anything else in Australian hip hop. Larry has an eclectic sound which incorporates his African roots, mixed with hip-hop, electronica and dancehall. Carmouflage Rose is back with another chilled out hit ‘Let Me Down’ featuring George Maple. ‘Let Me Down’ sees the Brisbane-based artist further combine elements of his cultural influences from Zimbabwe with his love for contemporary urban music, as well as share the vocal duties for the first time on one of his tracks with George Maple.